As I write this, I am struggling to breathe through my nose. My sinuses do weird things when I stand up too quickly and my throat is giving my voice a particular quality which would be more appropriate on the end of a 1800 phone call. 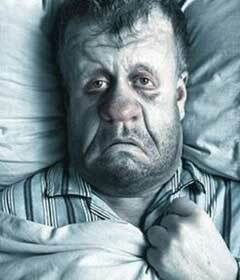 As you may have guessed, I have the flu. And due to a tendency I have to react like the man from this ‘man flu’ video , I am pretty sure that it is the nastiest flu ever. We all know having the flu is the worst. There are never enough cold and flu tablets in the house, you start basting everything in garlic as if to ward off vampires, and even the softest tissue feels more like a piece of 60 grit sandpaper against your reddened nose. A couple of years ago, I actually got swine flu. Which is like having a regular flu that punches you in the ribs. Due to a series of debacles, I was misdiagnosed and was told to ‘soldier on’ as it were. Needless to say, I have had my fair share of experience of the sniffles. That being said, I have very little time for others who deem it appropriate to share their sniffles with others. I understand that people cannot always help the spread of a contagious condition. I also fully empathise with those who have to continue to work because their boss might not give them leave, or who have to study because their lecturer refuses to give an extension for a common cold. I get that. What I don’t get, are people who fail to adhere to the most common of courtesies such as covering their mouth when they cough, utilising a tissue or just generally being hygienic when dealing with their flu. I accept that there is no delicate way to battle the common cold. We all know that rest, good diet and possible medical attention are the only ways to battle this bad boy. However, we also know that whilst your life may have paused in a temporary heap of dirty tissues, the rest of the world continues on, and so you may be caused to interact with the world during this time. More often than not, a cold is a way of your body telling you that you might be overdoing it. When we are stressed or run down, our bodies are more susceptible to catching these sorts of contagions. Pretending like you are not sick is only going to make things worse as your body will not have time to rest. Plus it will annoy everyone around you who have to deal with the symptoms that you are refusing to address. Yes after a while, tissues may start to hurt your nose. And yes, you might start considering seeking out the fleece of a newborn lamb as a suitable alternative to tend to your irritated nostrils. The point here is that regardless of what respite you find, it is important to consider that doing something to address your leaking nose is better than nothing. Not only is this common sense as you are managing the symptoms of your condition before they manifest into something else, but it is also common courtesy, as again people around you are not subjected to incessant and audibly graphic sniffing. This may sound overly straight forward, but the amount of times I have had people cough on me justifies the following reminder – this is gross. Just gross. And even if I didn’t say anything when you coughed and spittle landed on me, I noticed. Everybody noticed. One particularly bad flu season I made myself a lemon drink and dragged my sorry self upstairs to go to bed, only to trip over my ugg boots and land in said lemon drink. Needless to say, this was a low point. Rest up, find someone/somewhere to get chicken soup and if necessary, speak to a medical professional. As for me, I’m off to find myself an obliging lamb…. The best part of having a blocked nose is eating and breathing at the same time – nothing beats the sound of inhaling and exhaling while chewing with an open mouth. This entry was posted in Opinion and tagged etiquette, health, manners, modern ms manners. Bookmark the permalink.